In 3-quart saucepan, place tomatillos; cover with cold water. Cook over medium heat 10 to 15 minutes or until tender. Drain and discard water. 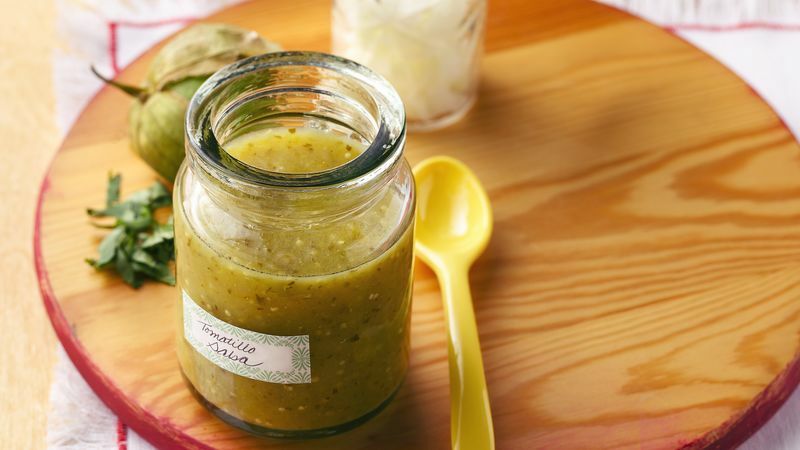 In blender, mix tomatillos and remaining ingredients except oil and tortilla chips. Cover and blend until desired consistency. In 2-quart saucepan, heat oil over medium heat. Add tomatillo mixture. Cook 10 to 15 minutes, stirring constantly, until mixture is thoroughly heated and darker in color. Serve warm or cold with tortilla chips. Tomatillos are green fruits that look like cherry tomatoes. They come in husks; remove the husks and rinse off any sticky residue before chopping. Salsa's not just for dipping. For hundreds of ways to incorporate salsa in your cooking, search "salsa" on pillsbury.com.